Williamson received more hardware for his already overstuffed trophy cabinet. LOS ANGELES — Zion Williamson of Duke and Sabrina Ionescu of Oregon won the John R. Wooden Awards as the nation's top men's and women's players of the year at the College Basketball Awards Friday night. They received their trophies during the fifth annual ceremony at The Novo in downtown Los Angeles. Williamson received more hardware for his already overstuffed trophy cabinet. 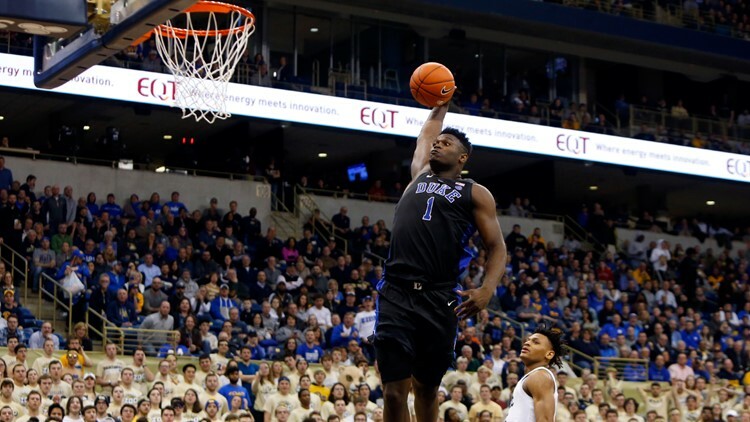 The freshman has collected numerous awards - including The Associated Press player of the year - during his freshman season in which he led the Blue Devils to the Elite Eight of the NCAA Tournament. Ionescu was a surprise winner on the women's side. The NCAA Division I leader in career triple-doubles with 18, she led the Ducks on a Final Four run. The 21-year-old point guard plans to return for her senior year. Ionescu beat out Connecticut's Napheesa Collier, Asia Durr of Louisville, Iowa's Megan Gustafson and Teaira McCowan of Mississippi State. Kruger is 160-105 in eight seasons with the Sooners. He's the first Division I coach to guide five different schools to the NCAA Tournament. The individual awards were decided by a combination of fan votes and input from the Basketball Hall of Fame's selection committee.